Boca Raton, Fla. – February 7, 2017 – Specialty-specific health information technology leader Modernizing Medicine, Inc. today announced that its electronic health record (EHR) system, EMA™, is among the first in the United States to include built-in Merit-based Incentive Payment System (MIPS) composite score reporting, robust analytics and benchmarking reports that document healthcare providers’ performance in near real-time. 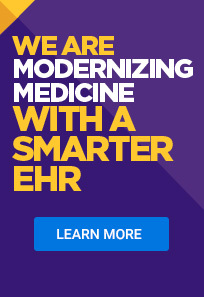 Modernizing Medicine’s EHR system can calculate how providers perform with a single MIPS composite score that factors in three weighted performance categories: Quality, Advancing Care Information and Clinical Improvement, plus Resource Use coming in 2018. The overall score then indicates performance as measured and compared to peers across a number of different criteria. Providers that exceed the minimum threshold in 2017 can be paid more money versus those that don’t. Providers that do not meet the minimum threshold can receive a substantial reduction in payments from the Centers for Medicare & Medicaid Services (CMS), in accordance with their new Quality Payment Program that started at the beginning of January 2017. Dermatology: Thursday, February 23, 12:00 P.M. ET, with Michael Sherling, MD, MBA, co-founder and Chief Medical Officer. Register here. Ophthalmology: Friday, March 3, 12:00 P.M. ET, with David A. Goldman, MD, Ophthalmology Team Lead, Anterior Segment. Register here. Urology: Wednesday, March 8, 12:00 P.M. ET, with Nadeem Dhanani, MD, MPH, Medical Director of Urology. Register here. Gastroenterology: Thursday, March 9, 12:00 P.M. ET, with Julie C. Servoss, MD, MPH, Medical Director of Gastroenterology. Register here. Orthopedics: Friday, March 10, 12:00 P.M. ET, with Jason Weisstein, MD, MPH, Medical Director of Orthopedics. Register here. The company previously announced their commitment to support clients with the transition to MIPS with the modmed Pledge™, services designed to help providers achieve exceptional performance or avoid negative Medicare payment adjustments. The announcement of the general availability of this solution is being made in advance of the 2017 Annual Healthcare Information and Management Systems Society Annual Conference & Exhibition (HIMSS17), the largest health information technology conference in the country. Attendees can receive a live demonstration of how MIPS can work live in an EHR system and view an easy-to-read scorecard that shows providers how they perform in comparison to their peers. Attendees at HIMSS17 can see Modernizing Medicine’s MIPS solution live in the EHR system, as well as the entire suite of services – including Practice Management, Revenue Cycle Management and Analytics – at booth 4545 during exhibit hours from February 20-22, 2017. To request a demo, click here.